As is usually the case with new lines from The Tie Bar, they start with only a few options in basic, staple colors. You can get the classic navy or grey, or one or two other variations. No fancy or unique patterns. Just standard, solid pants. No complaints here, though, as this is a perfectly fine place to start, and, if all goes well, they can always add more options in the future (and they likely will). I went with the light grey option. The fabric is a very standard light grey, and looks really nice both from afar, and up close. This is the sort of pant that will go with just about any outfit you throw at it, pairing just as well with black shoes as it does with brown or even navy (the same goes for blazers, too). I often find that many grey pants have shades of black, or marled black within the fabric, making them harder to pair with brown shoes. That is not the case here, thankfully. This is a true grey, and the color, super light texture, and straightforward pattern are ideal here. I love this color, and they did a great job with the style of these pants. I hope they can add more unique, textured, and patterned pants as time goes on (otherwise, there is less of a real pull to order from The Tie Bar as opposed to anywhere else). The Tie Bar has always prided themselves on bringing much higher quality than what you are paying for. This was always true about their ties, but I don’t think it carried quite over to their shirts. Their shirts run for around $50, and you get what you pay for there — not much more. Which is fine, but it’s important to note, because, when we come to the pants, this is even more true. While The Tie Bar claims that these are $250 pants for their low price of $75, I just don’t see it. The fabric is a 97% wool and 3% spandex blend to provide a bit of stretch. This stretch is very, very subtle (which is either good or bad, depending where you fall on stretchy fabrics), but the pants do feel super comfortable on. The fabric is also super, super thin and even wispy, bordering, dare I say it, on being see-through. While this might be nice for the summer months, if you are getting these as a staple, four-season pant, that is a mistake. You will freeze in the winter in these things. I don’t care if The Tie Bar will tell you these pants are only so thin because they are using super-fine wool, or whatnot, they are simply too thin to not be advertised as some sort of lightweight, or summer fabric. Construction overall is fine, though. There is not much to write about here. There is a standard clasp fastening mechanism, with a standard zipper. Everything is decent quality, as you would find on any pants in this price range. There are no elements of this pant that seem particularly premium or $250-worthy. At $75, though, this is exactly the sort of construction you would expect to find, save for the extreme thinness of the pants. Again, I am not sure how intentional this is, or why they are so lightweight, but they are. In summary, these are very lightweight pants, with only a hint of stretch, and very standard constriction quality for this price point. These dress pants are available in either an Athletic fit, which is the roomier, more standard cut, or a Trim Fit, which claims to fit you as if it was custom tailored. Yeah… don’t believe the hype. These pants are not so fantastic fitting. It’s not terrible, but if you’re a slimmer guy, these pants are really not all that slim. You can compare them to a typical J Crew Ludlow suit pant in the chart below and see just what I mean. 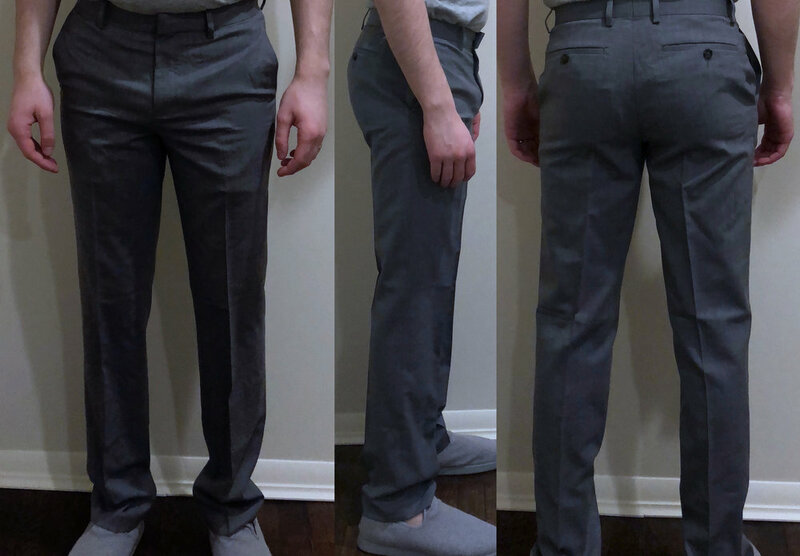 In short, these pants were too long (which is expected, and is a super quick and easy fix at a tailor), and not tapered enough for my slimmer taste and build. These would, for my taste, need to come in almost half an inch, tapered, up the leg. That is quite a bit of work to do to pants, especially when J Crew Ludlow pants fit just about perfectly off the rack (though, admittedly, do cost a solid amount more). The seat fit mostly fine, but the waist could likely come out just a tad which would alleviate some pulling you can see. These pants seem to be a bit smaller in the waist and seat than many 30 waist pants I have tried. Overall, the fit on these is fine, but not if you were looking for a true slim fit. If you were expecting something more standard fitting, then these should work out great for you. Though, my advice would be to go with the Trim Fit for sure — the Athletic Fit is likely much too wide, unless you truly have a particularly athletic body/thighs. These pants will run you $75. For dress pants of this kind, that is on the more inexpensive side, surely. Still, the fabric is a bit too thin for my taste, despite looking and feeling good on. Plus, if you will need to put in a bunch more tailoring dollars into these things, then the price does rise a bit. All of that needs to be considered. In short, for the summer months, these are nice pants, and might be worth buying and tailoring for your body. Overall, though, I would like to see some more effort here on The Tie Bar’s part, perhaps offering a slimmer fit, and certainly some thicker, heavier, standard four-season fabrics, as well as more unique fabric options. If they do that, then at the $75 price point, they may indeed have a winner on their hands, and yet another reason to shop there over their competitors.